Chris Gayle has already created an enigma in this year’s IPL with his batting exploits at the top. However, even without the bat, he continues to be a character on the field. The Universe Boss sure knows how to hog the limelight his way. An incident in today’s game was a sublime proof of the same. As wicketkeeper KL Rahul left the field for some time leaving his gloves, Gayle was off to some fun. He quickly donned the wicketkeeping gloves and even went on to practice some mock catches and stumpings. The Hyderabad crowd loved Gayle in this new avatar as they cheered for him. Suddenly @henrygayle WK pandra maari.. Panna pola ???✌???? After restricting the Sun Risers Hyderabad to 132/6 in their quota of 20 overs, the odds were high in favour of Kings XI Punjab. Pacer Ankit Rajpoot was stupendous as he took a five-wicket haul. Mujeeb Ur Rahman got the lone wicket of Shakib Al Hasan. As for Hyderabad, Manish Pandey went to register a slow half-century. Chris Gayle again seemed in a mood to clear the boundary as he hit it out of the park twice. However, once he got out, Punjab suffered a collapse. The spinners Rashid Khan and Shakib grabbed the stage with quick wickets. The Sun Risers again managed to defend a low target, thanks to yet another marvel performance with the ball. The opener has already been entertaining crowds with his power hitting for Kings XI Punjab. He already has two fifties and a hundred in this year’s Indian Premier League. Earlier, he wasn’t retained by his previous franchise Royal Challengers Bangalore. After two rounds of being unsold, Kings XI Punjab owner Preity Zinta raised a bid for the big guy as they attained him for Rs 2 Crores. 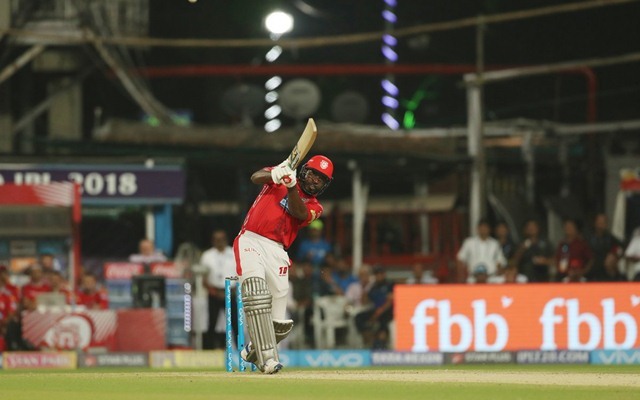 Seems like Gayle hasn’t taken that in his stride as he seems to be in a lambasting mode against the opponents. With 252 runs, he’s already amongst the top run scorers this IPL. All the opposing sides are already on high alert for Gaylestorm.